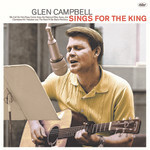 The lost album from Glen Campbell, Sings For The King contains eighteen recently unearthed and restored studio recordings from 1965-1967 that cast new light on the influence that Campbell had on America's greatest rock and roll star, Elvis Presley. Before Glen Campbell's breakthrough single, "Gentle On My Mind," Campbell was recording songs for legendary songwriter, Ben Weisman, who wrote an unmatched 57 songs recorded by Elvis Presley. Campbell had an uncanny knack for singing in Elvis Presley's key, and thirteen of these tracks went on to be recorded and released by Presley. The collection highlights Campbell's incredible musicianship and contains "We Call On Him," a previously unreleased duet fused from the vocals of Presley and Campbell.